mowing around obstacles, such as trees in orchards. Please contact the email address below to discuss your requirements. Scythe work projects Why use a scythe? If you are interested in the development of a climate friendly gardening network in the Wessex area, either as a client or as a provider, then please get in touch. One definition of a ‘meadow’ is simply an area of grass that is mown (rather than just grazed). So just mow with a scythe and you will have a meadow. In the time before the first mow in the summer, flowers can flourish. Even without any colourful flowers there is a beauty to the process. It is wonderful to see what species of flowers and grass arrive at nature’s hand. 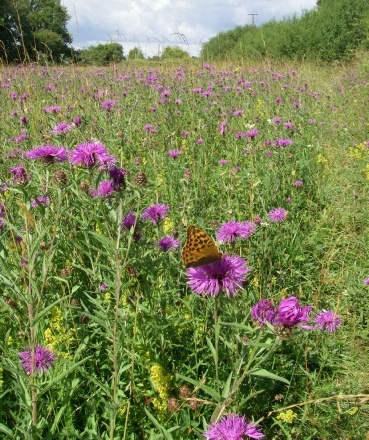 Given time wild flowers will become established from the ‘seed bank’ in the soil, and newly transported from nearby populations. It is important to remove the cuttings so that the nutrients do not build up in the soil. Reducing fertility (anathema to many farmers and gardeners) reduces the vigour of grasses, and allows wild flowers to compete with them. To speed up the increase in diversity, and to steer it towards more colourful species, seed can be broadcast in spring. It will still take three years or more to see significant results, even with the best combination of seed, soil and management. A more expensive option is to plant plugs of your chosen species. Either way, don’t invest resources in seed or plugs until an appropriate management regime is in place. The timing of the first summer mow is crucial. The need to remove nutrients, which an earlier cut will do better, should be balanced against a requirement for leaving existing flowers as long as possible to set their seed, and so continue to thrive and spread. One of the most important advantages of using a scythe to mow an area of meadow by hand, is that the operation becomes ‘progressive’. Lush or rank areas can be mown first, leaving the best colourful displays to an appropriate time for them to set their seed.